Shall I propose a toast? You don’t have to go for a mass suicide to know if you had a cult. Just order everyone to go naked for a day or something. You’ll hear about it. That and you’ll feel less guilty. Order mass suicide OR order mass-ive pizza for the cult to eat. Remember no taxes once we all file paperwork saying you… talk to aliens? I dunno, tell us whatever, just make sure there are no shrooms on the pizza. Plain cheese is the safest bet. Best comic in a while 🙂 Especially in combination with the alt text. Also, I second Joe’s no-shroom policy. Hmm, I need to qualify this statement: I’m NOT saying the previous couple of comics were bad at all… it’s just that this one stands out! Do we get bubble wrap jumpsuits? Nothing wrong with shrooms, Joe. Will gladly pick them off your slice. Pretty sure at least tens of people will order pizzas in Luke’s name, if that be His will, and depart this world in one massive, unifying act of gluttony. I’d order pizza for any reason at all if i had money to spend…Well actually I have money but I can’t decide whether to buy “inkdeath” (wikipedia it) or pizza………..
You can and most definitely should get Inkdeath from the library. Don’t spend money on it. WRT alt text, usually sales improves after suicide. 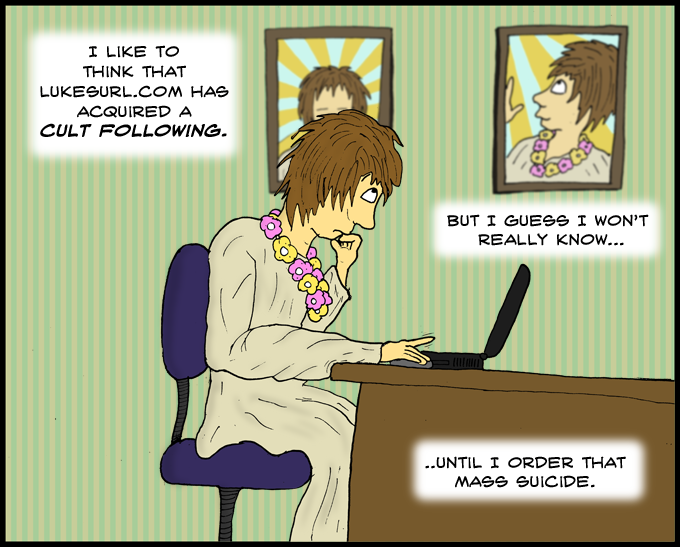 Shouldn’t mass suicide then improve it further?